I thought I would finish this sock today, but I had an appointment at the allergist’s office this morning and then had to run a few errands before making the drive back to Morro Bay. 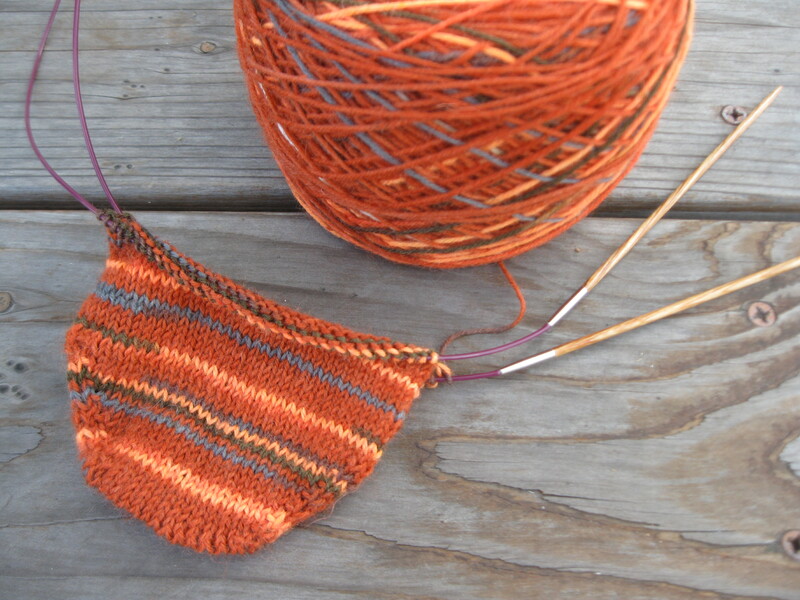 I did manage to turn the heel and start knitting the cuff, so I think I should be pretty close to done by tomorrow. We drove back to Ventura from L.A. today. It was a long, traffic-filled drive because apparently everyone decided to go to the beach or just be out on the road for Father’s Day. Tomorrow we head back up to Morro Bay, so that will be another two and a half hours in the car. 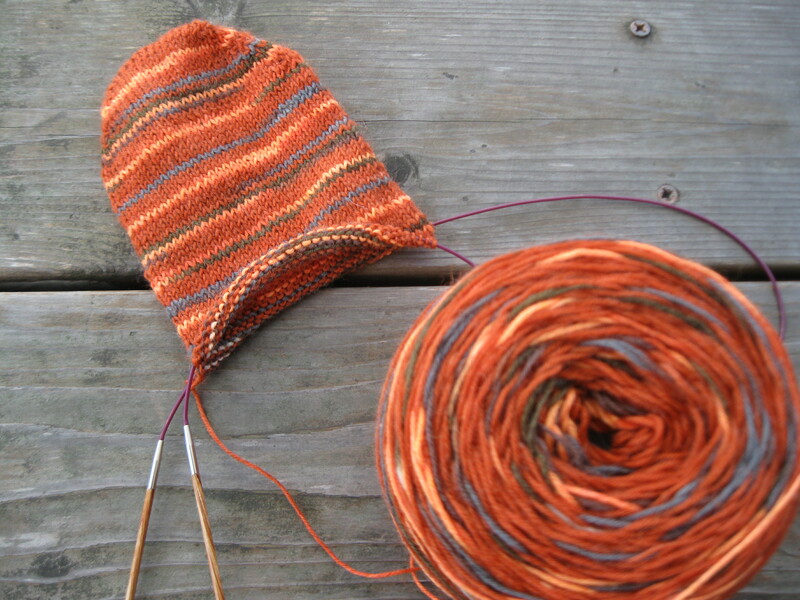 I may have a finished sock to show you for tomorrow night’s post. 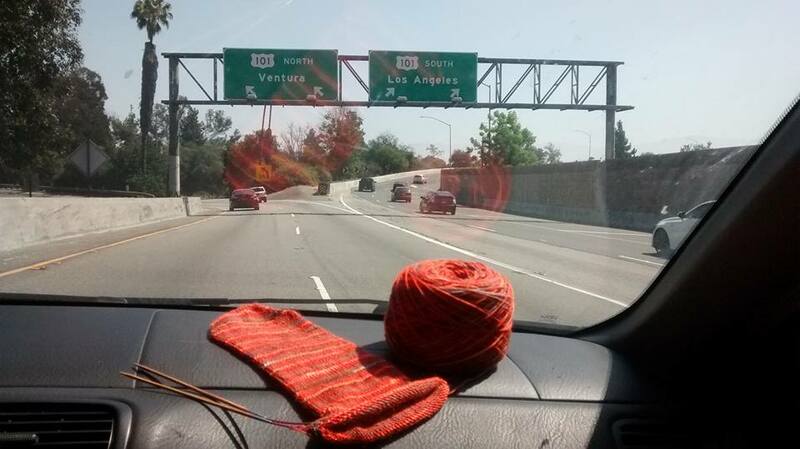 Categories: Adventures with Sean, Handmade | Tags: knitting, socks, Ventura | Permalink. I’m typing this entry in a hotel room at the Hampton Inn in Carson. Sean and I drove into L.A. this afternoon to see the L.A. Galaxy play Philadelphia Union at the Stub Hub Center. The game starts at 7:30 PM, but we have to leave in a few minutes to allow for the time it takes to walk the mile to the stadium, get through security, check out assorted L.A. Galaxy merchandise, buy me cotton candy and a soft pretzel, mill around with the rest of the crowd, and find our seats. I brought my knitting along and worked on my sock during the drive. You can’t really tell from the photo, but I’m up to the gusset, which is where things start to get a little more exciting, because I’m that much closer to turning the heel. Unfortunately, as much as I’d like to bring my knitting to the game, I’ve been to enough of these events with Sean to know that’s not a good idea. So I’ll leave the knitting for now and pick it up again for the drive back home. 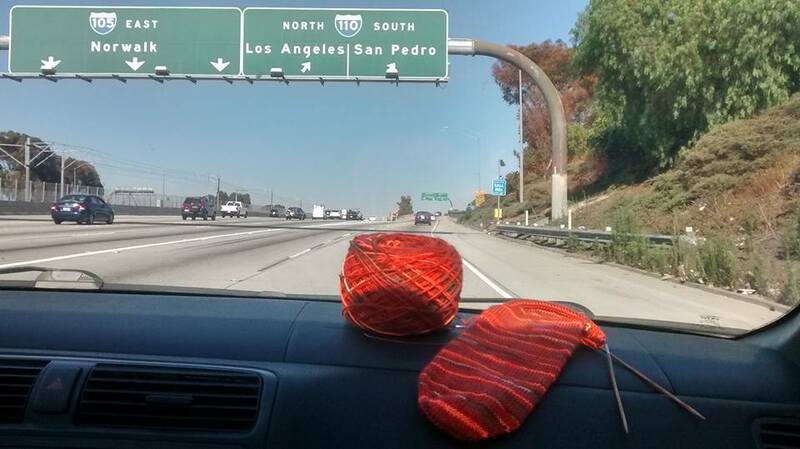 Categories: Adventures with Sean, Handmade | Tags: knitting, Los Angeles, Sean, socks | Permalink. Last year on September 1st, one of my neighbors was offering a young angel’s trumpet plant free to anyone who wanted it. 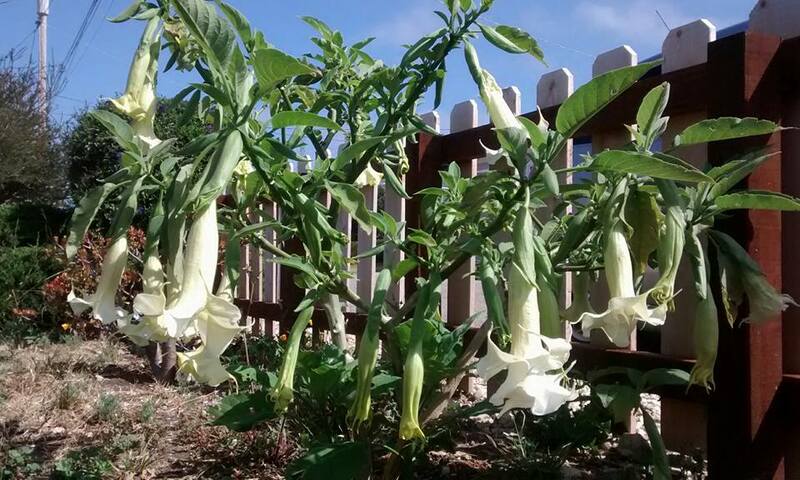 This neighbor had recently learned that the angel’s trumpet (aka brugmansia) was poisonous. She had a couple of dogs that she let run around in her backyard, and she didn’t want to take any chances of accidental dog poisoning. Having no children, pets, or any kind of nice flowering plant in my front yard, I quickly volunteered to take the free brugmansia. Sean and I went over to her house with a bucket, and her husband dug up the little plant. It was only about three feet tall and pretty much just a forked, leafy stick at the time, but we took it home in our bucket and planted it in the front yard. Coincidentally, that day was also my birthday, so it was a neat little way to mark a new year in my life. I don’t typically have a green thumb, but with a little bit of luck and some internet research, I was able to nurture that forked leafy stick into an actual thriving plant. After a few months, the trumpet flowers started to bloom. 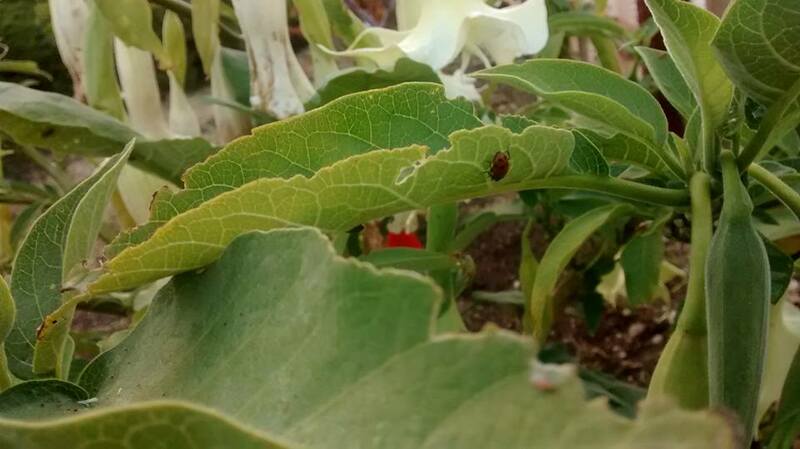 The bummer, though, was that beetles were eating the leaves. I wanted to wipe out those little critters, but I also didn’t want to douse my plant with pesticide. 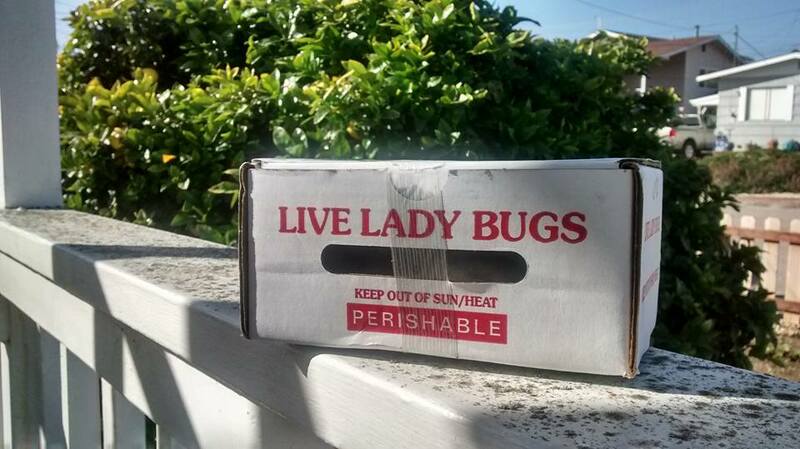 I looked into organic alternatives and decided to order some ladybugs online. The smallest available quantity was an order of 1,500 ladybugs. They were supposed to arrive via UPS two-day air, so I told Sean (who is currently on summer vacation) to stick around the house and wait for the UPS guy since I had to be at work all day. At around 11:30 AM, I was in my office when the phone rang. It was Sean. 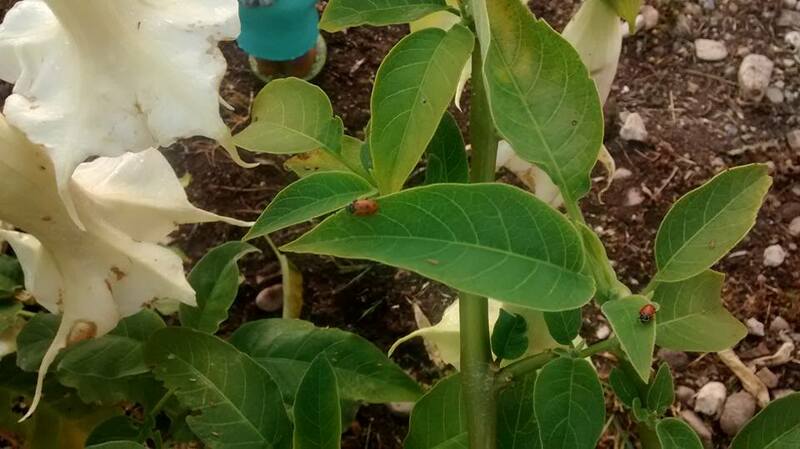 “Just wanted to let you know your ladybugs arrived,” he said. I was speechless. In that moment, I could just see 1,500 ladybugs flitting around the cathedral ceiling of my beautiful Morro Bay house, while I sat helplessly at my desk inside the prison. So that’s what we did, but not all 1,500. I’m going to ration them out a little at a time over the next few days. And even if they don’t get all the beetles, they’re still very pretty to look at. Categories: Adventures with Sean | Tags: angel's trumpet, brugmansia, ladybugs, Morro Bay, Sean | Permalink. Yesterday at work, I kept feeling like it was a Thursday and then realizing that it was only Wednesday. Today felt like it should be Friday, but then I would remember it was only Thursday and that I still had one more day of work to go. Such a disappointing feeling. Have you ever had that kind of a week? 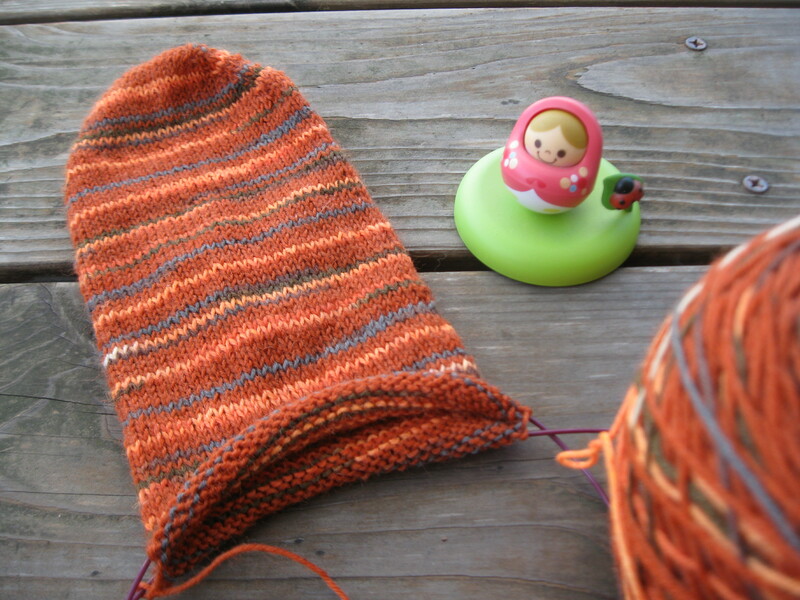 I knit a few more rows on the sock. The sock itself made for a boring photo, so I threw in one of my little unazukin toys for an added bit of kawaii. It doesn’t look like a lot, but I’ve been making some progress. I went back to work today. It’s always tough getting through a 10-hour-day after returning from a nice long break. Now that I’m home, I could just eat dinner and go to bed, but I started my half marathon training plan last week and still need to go run for thirty minutes. 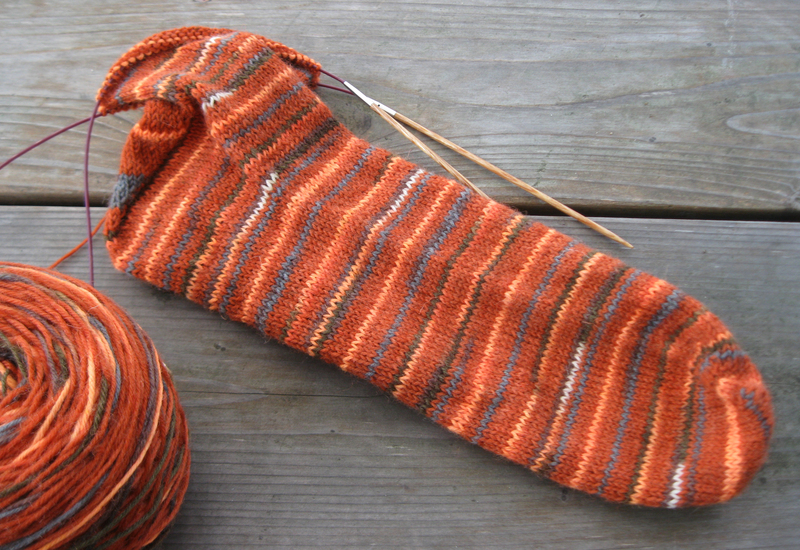 In other news, I started a new sock.